Masatsugu Miwa was born in Yamaguchi in 1971. He graduated from Aoyama Gakuin University in 1996. 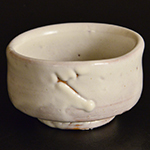 He finished his ceramic study at Kyoto-shi Kogyo Shikenjo (the Industry Experimental Laboratory in Kyoto City) in 1998. He has studied under his grandfather, Jusetsu, and his father, Eizo.